The process is this. Operating at pressures of 1000 psi+ Koolfog produces micron-sized water droplets that, while evaporating and turning to vapor, remove heat from the air, cooling the surrounding area. The fog produced by a Koolfog system reduces temperatures and adds humidity to precise levels. 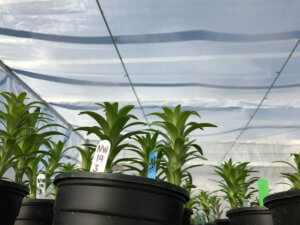 The system can be designed for small or single compartment greenhouses, screenhouses and shadehouses or can be designed for large-scale operations with multiple zones. Greenhouse control systems are able to leverage Koolfog solutions to output fog at constant pressure levels, pulse output, or output using variable pressure control or staging allowing for control of microclimate environments within a greenhouse facility. It is, however very important that the humidity around the leaves still allow the leaves to transpire water. The transpiration stream within the plant is responsible for carrying nutrients from root to leaves and to all the leaves to cool themselves. Through precise control using sensors, it is possible to fine tune fog cooling systems to optimal conditions. Research being conducted by Prof Heiner Lieth at the University of California, Davis is testing this.